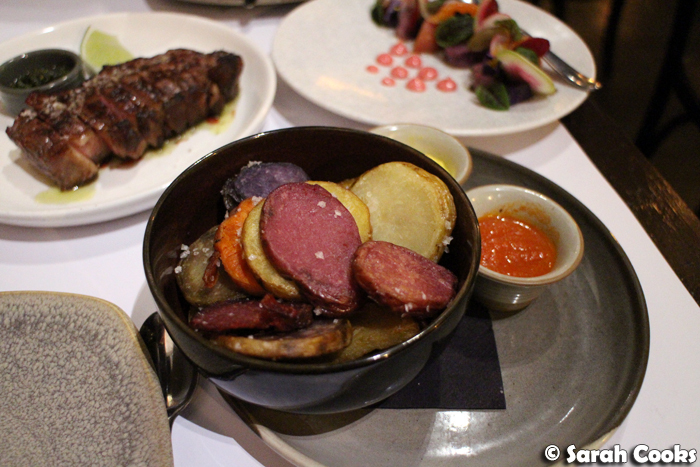 Sandra visited HH once a few months back for a work thing, and came back raving about the churrasco beef, which she insisted I just Had To Try. (Spoiler alert: super delicious). 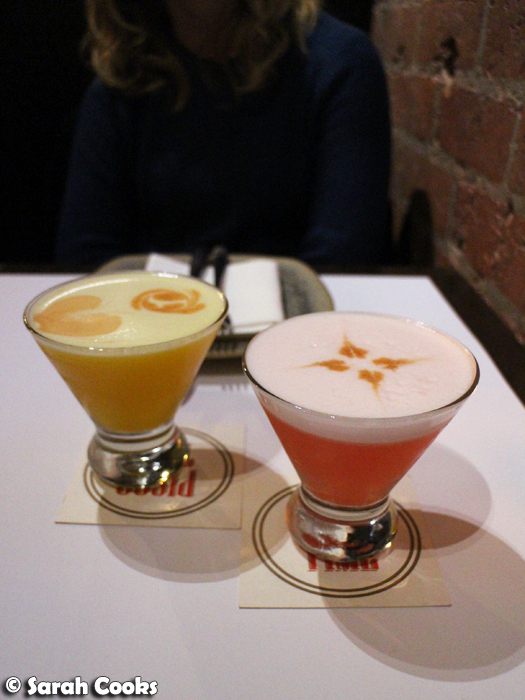 We've since visited a bunch of times, and it's become one of our favourite restaurants - perfect for a quick dinner in the city if we're rushing off to a show (or just want to get home early, 'cause we be grandmas now), and also with a pretty sweet Happy Hour (4:30 - 6:30pm) with $12 pisco sours. 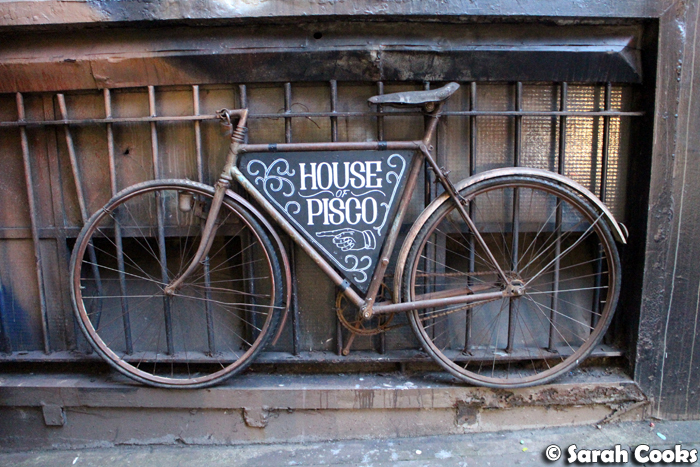 They've got an extensive cocktail list, but I tend to stick to the pisco, because delicious. 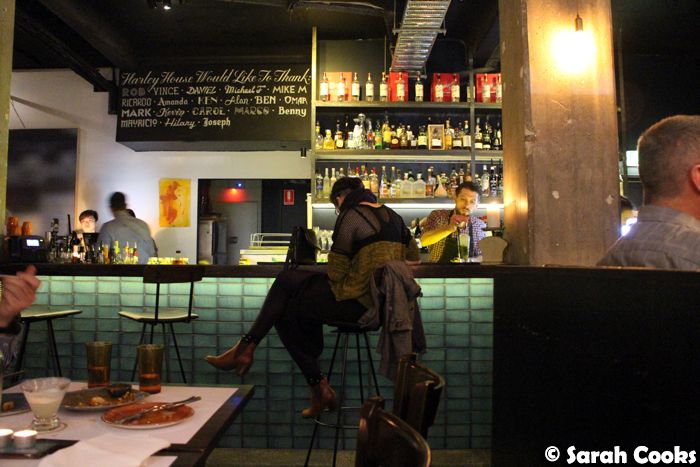 Speaking of delicious sour things, I've tried a couple of their ceviches and really enjoyed them. 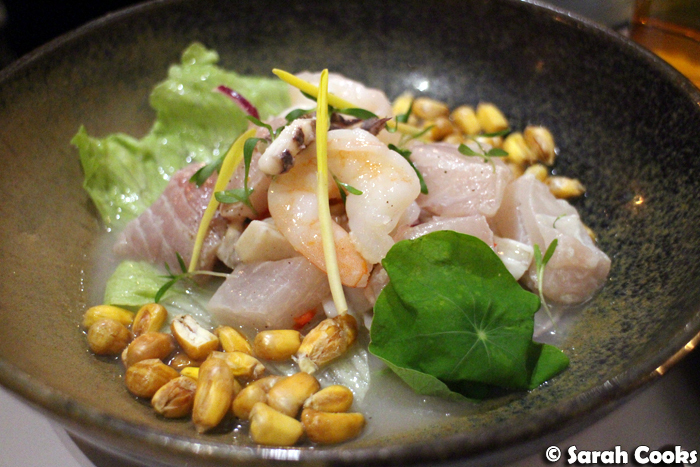 Hot tip: the ceviche mixto de mercado is a very generous serving! Good for sharing. The yellowfin tuna ceviche special we tried on another visit was much smaller (I imagine because yellowfin tuna is more expensive than the mixed seafood in the other ceviche), but was still very good. 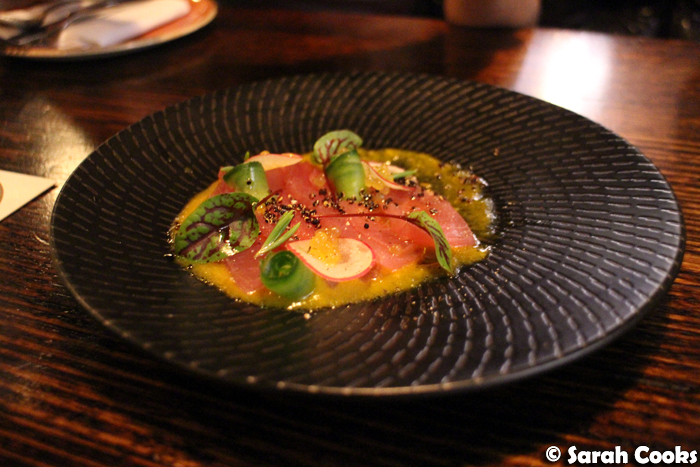 From memory it came with a mango sauce, the sharpness of which contrasted well against the rich, oily tuna. 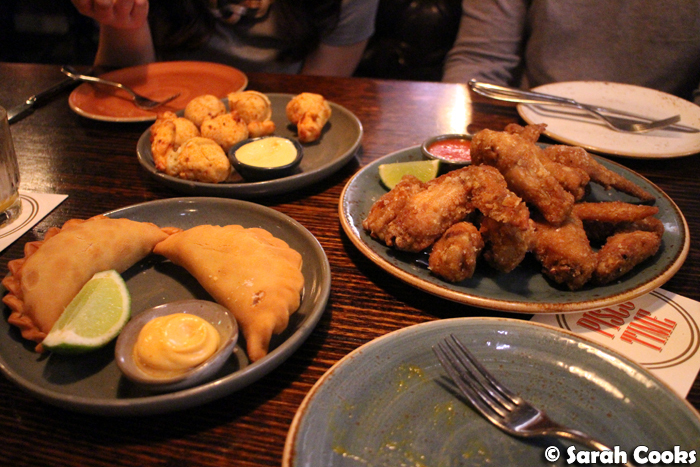 The rompebocas (small plates) section of the menu has a lot of great drinking food - the crispy fried chicken wings and empanadas are both well worth ordering. 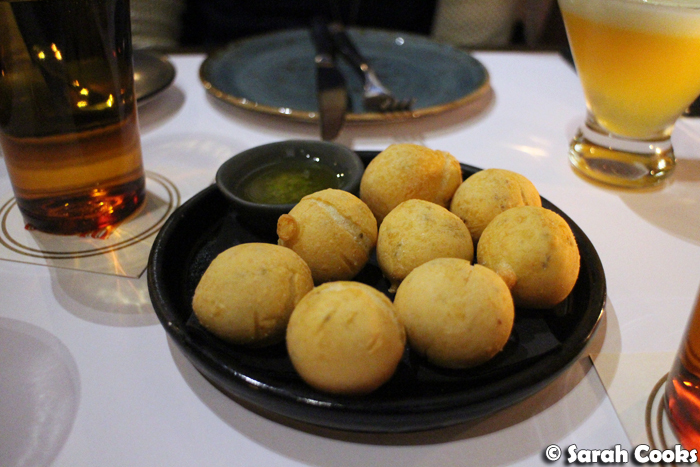 My favourite, though, is the chipa with chia seeds, which we order every time. Similar to my beloved pão de queijo, these are chewy little cheesy breads made of tapioca flour. Let's take a look at the meat! 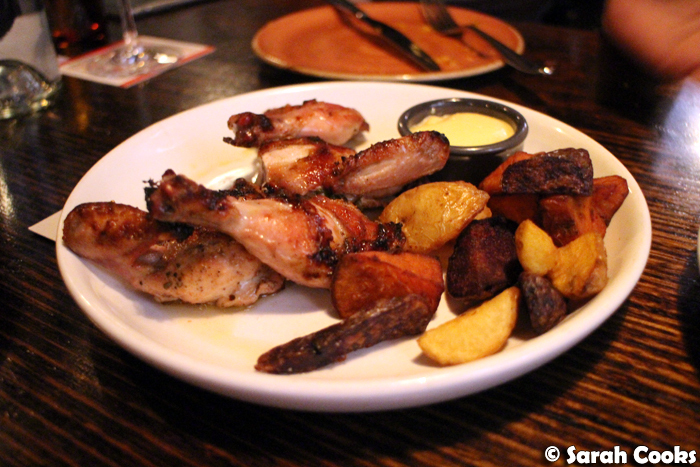 The spatchcock a la brasa (i.e. Peruvian rotisserie chicken, made with spatchcock) was smoky, juicy and tender. And it came with bonus potatoes - win win. The spatchcock was quite good, but for my money, the best bet is the beef. 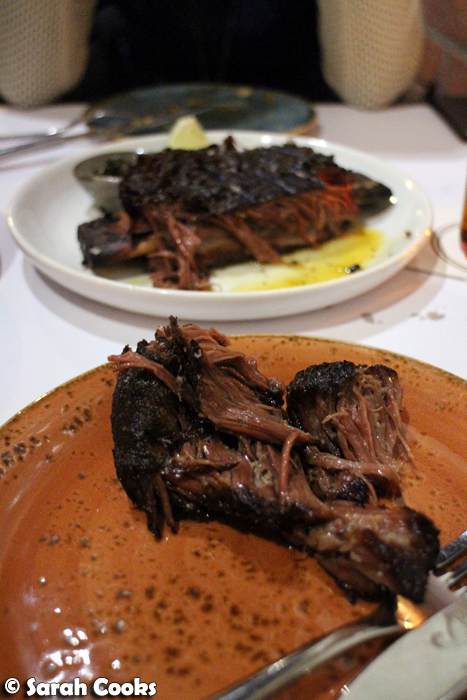 Check out this slow-cooked asado! The asado con hueso (i.e. 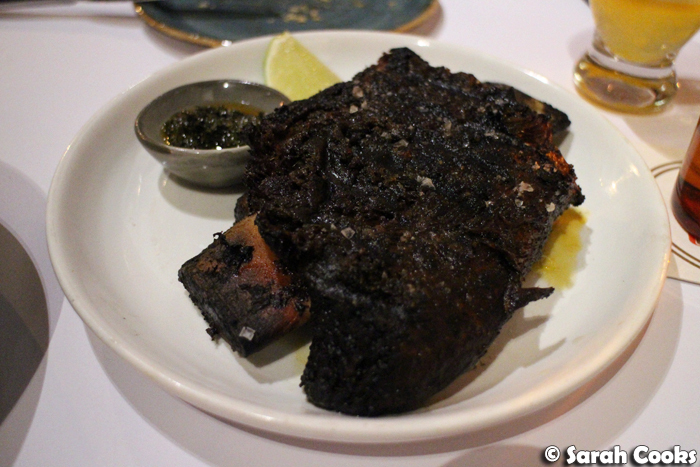 "with bone") had a great crust (or bark) on the outside, and was incredibly tender, falling apart at the prod of a fork. 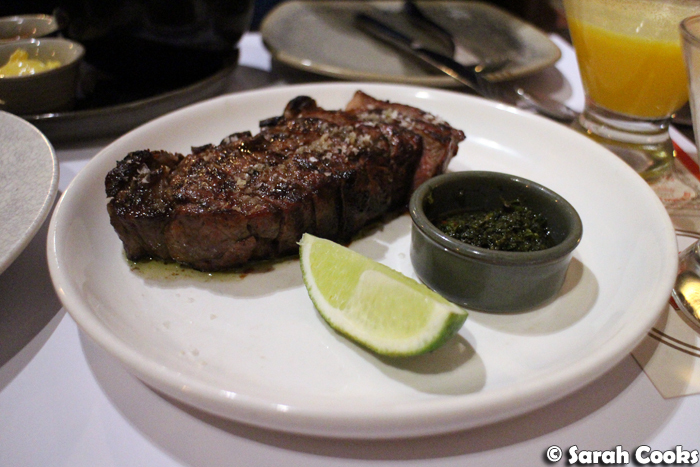 The churrasco beef is different but equally delicious - rather than being slow cooked, this one is a grilled sirloin steak, cooked medium rare and sliced into thick slabs. I've had this one a few times and it's always great - perfectly cooked, well seasoned and with a great char. 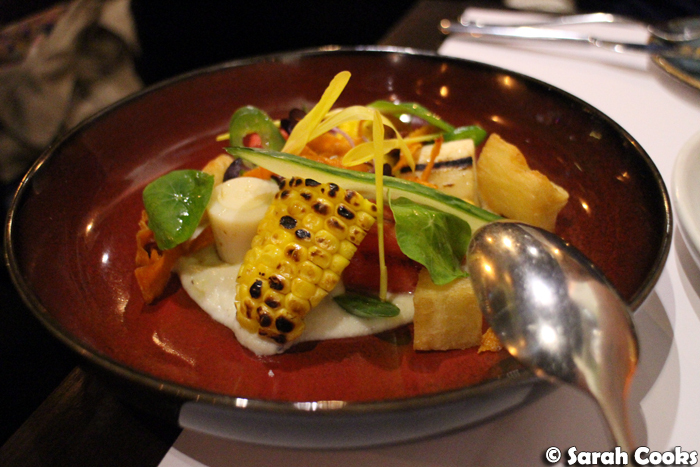 The vegetable dishes are good, usually comprising traditional Peruvian ingredients presented in a contemporary way. We don't usually order dessert, but when we brought our friends An and Adri here for a birthday gift, we couldn't not order a few sweet things! 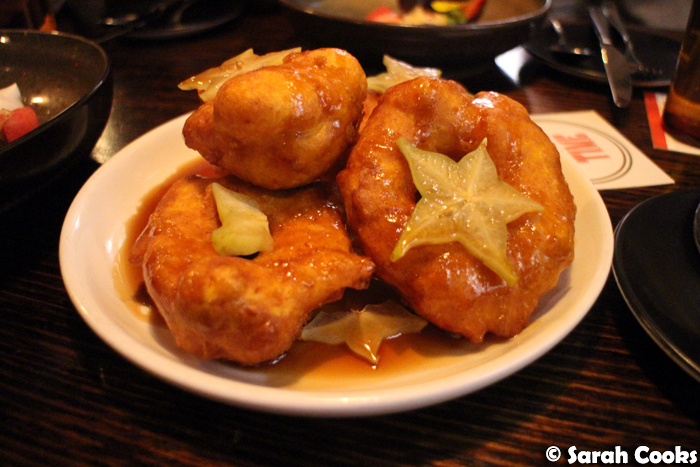 My favourite were the picarones - sweet potato and pumpkin donuts, in a sweet plum syrup. 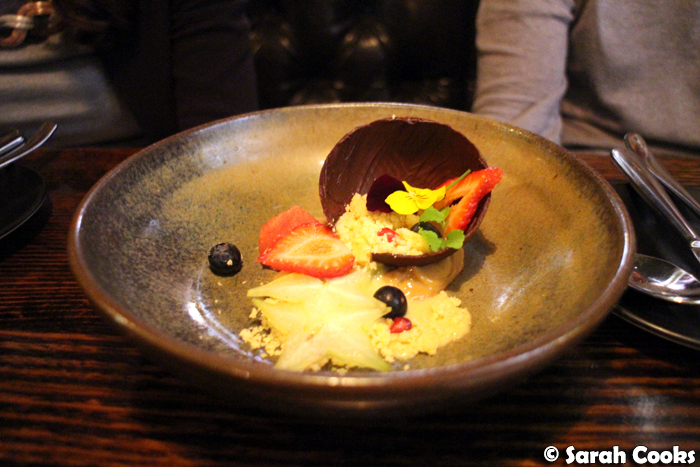 The alfajor de chocolate didn't look like any other alfajor I'd ever tried before (sah fancy! ), but the familiar combination of shortbread crumbs and sweet, sweet dulce de leche was very tasty. 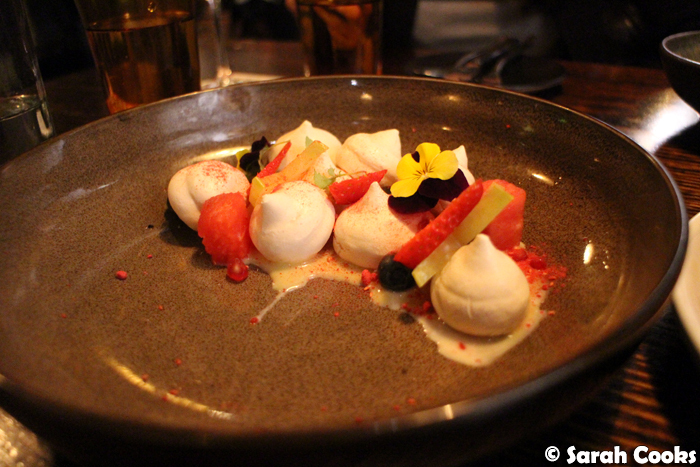 The suspiro limeno was, again, a fancy restaurant version of a traditional South American dessert. (Wikipedia has informed me that the suspiro de limeña is usually served like a little trifle or pudding, with a thick milk custard on the bottom, and meringue on top). 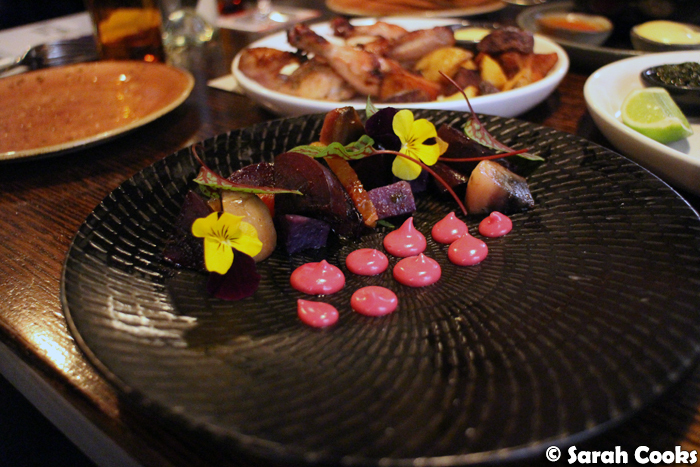 Great cocktails, great meat, great atmosphere. Great restaurant! Thanks for this amazing blog, Sarah. Its always a great night when we see your smiling face coming down those stairs!